Schematic presentation of spermatogenesis inside mammalian testis (left), and of a seminiferous tubule cross-section (right). Left: Spermatogenesis is the process of sperm cell maturation. The spermatogonium self-renews by mitosis and undergoes the last mitotic division to give rise to primary spermatocytes. Primary spermpatocytes then undergo the first meiotic division (M-I), yielding secondary spermatocytes. The second meiotic division (M-II) then follows, giving rise to haploid, round spermatids that elongate and are released into the lumen of the semineferous tubules as spermatozoa (sperm cells). Right: Spermatogenesis is supported by Sertoli cells (blue) contained within testicular seminiferous tubules. 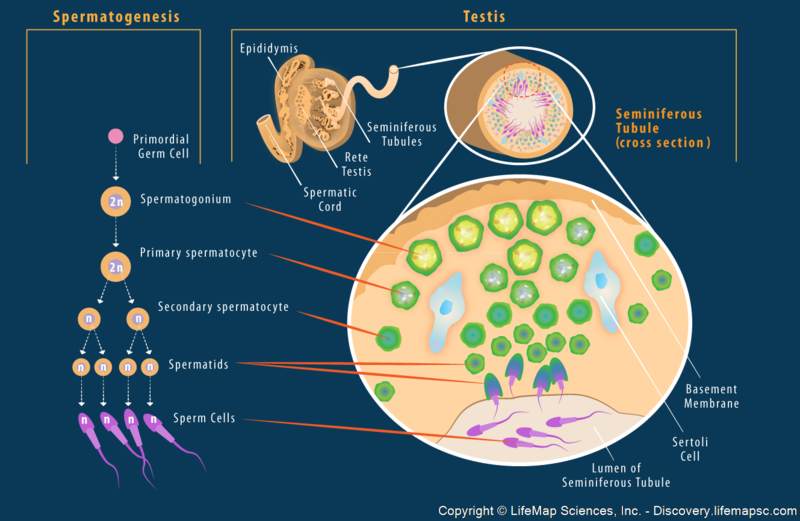 During the course of spermatogenesis, the germ cells gradually move towards the lumen of the seminiferous tubules as they mature.